I have to update my travel intinerary on here…I was gone for one day shy of 5 weeks on this past trip. I’ve now been home for 4 days and feels like I never left…isn’t that always the way?! I will keep it brief, as I have much to say about all the places I was in, plus I need to get on with the new stuff as well…all of my random thoughts that are current! OK, so my first US state and city (and studio) was in Birmingham, Alabama. (as an aside note, Alabama has now surpassed Texas as the fattest state in the US…not the case in the yoga studio, but I just thought it was interesting). The Birmingham studio is owned and operated by the lovely Kate Herrara Jenkins. Kate did her TT in Spring 2009 in Palm Desert (for the record, one of my favourite locations). She opened the studio four…oh, nope, FIVE months ago to a rowdy (perfectly so) and excited group of (soon to be) yogis. Birmingham used to have a Bikram studio, many moons ago, but had only a “HOT” yoga studio before Kate opened…so, needless to say, there were many people who had done some hot yoga, fashioned after the Bikram series, but who never really got any clear instruction and have been allowed to, let’s say, rule the roost…if you get my drift. One of my favourite things about the Bikram practice is the discipline of it and the structure. Now, that is one of the things that many people do NOT like about the Bikram practice…to each his own, yes? In my experience of meeting and teaching students who have their background in a hot studio, rather than a Bikram studio, there is usually a lack of these two characteristics in their practice…I digress. So, Kate has done a wonderful job of creating a warm and welcoming space to practice in. She has my FAV flooring, flotec (google it, and good luck, because it’s not easy to find!) in bright orange(!). This in itself made me very happy. I got to meet so many fun teachers who came to visit for the weekend as well as the yogis of the studio who are making it the success that it is. Kate and her husband, Kerry (former NFL player and sweet sweet Southern charm man) were wonderful hosts, I had such a good time in the good old South! Next I headed to Texas (yee haw!). Now, I have wanted to go to Texas for years now. I had several Texans in my TT and there was just something about them and the awe of Texas that had me thinking about that big Lone Star State (and, by the way it IS massive…like, its practically it’s own country right there in the middle of the US…). I started my Texas tour in Dallas at BYRichardson. BYRichardson is owned and operated by Yassie…Yassie and I were in TT together (one of the Texans), so we go way back. BYRichardson has been there for several years now, so is very well established. Yassie has done an amazing job of bringing in many yoga champions as well as several seminars and events. Her studio is HIGH energy…the teachers and the yogis. I was only in Dallas for 3 days but got a chance to hang out with some really cool people there. Next stop was Austin. Now, I need to say that every time I mentioned that I was going to Austin everyone (and I mean EVERYONE) told me how much I was going to like Austin…and then mentioned the Whole Foods. This was all I heard about Austin…how awesome it is and the Whole Foods. Well, they were all RIGHT! I DO love Austin. Austin is like a little island in the middle of Texas that people flock to. It is super alternative, very hip, modern (with almost a 50’s chic to it), forward thinking, booming, hopping, fun and multi-cultural. I stayed with Mardy and Jeff, the owners and operators of PURE Bikram Yoga. Austin has 111 places to do yoga…not ALL yoga STUDIOS, but places to do yoga…TAKE a yoga class. That’s a LOT, right? Yeah, that’s what I thought. The first night I got there, we went to an event called Yogasm (yes, I know, cheesy, but memorable), an event in downtown Austin put on by LuLuLemon. 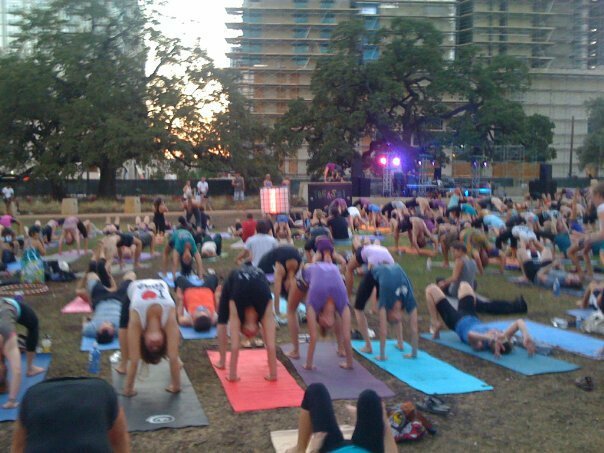 I got to do a (somewhat long) yoga class in the park with hundreds of other yogis (and, let me tell you, I was sweating *almost* as much as in a Bikram class, just from being outside…welcome to Texas, y’all), and see a little of what the yoga community of Austin has to offer. The week in Austin was so fun, I can’t get into it all. 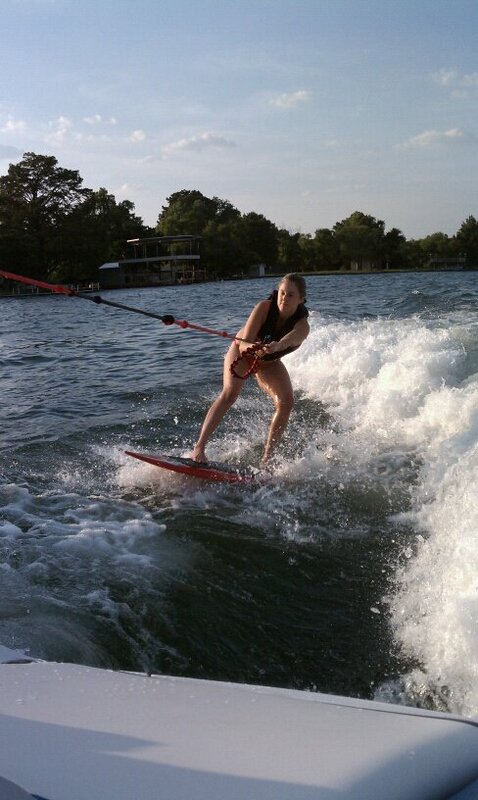 Not only did I get to do lots of yoga with all the yogis there, but I got to learn to wake surf (of which, I am now a pro! )…for as long as I can remember I’ve wanted to waterski (because that is the only water sport behind a boat that I knew of)…but it took me this long of my life to actually get out there and do it (water skiing is soooo passe, wake surfing is sooo where it’s at now). I think that my level of determination that I have from my yoga practice definitely helped me to learn to surf. Plus my balance and my sense of my body…don’t get me wrong, I took some pretty funny bails, but that really is the fun…well, part of the fun…the TRUE fun is in the triumph of actually surfing…seriously, one of the best things ever. Then came San Antonio. BYSA is owned by Lisa and Steve…Steve was in my TT (again, one of my formative Texans). I was only there for a few days, but got so much out of it. Not only did I get to teach some eager yogis, but I got to hang out with Lisa and Lynn and talk shop…which is such a blessing for me to be able to pick the brains of two amazing women who I truly admire. Plus, we got to go bowling. Who can compete with that??!! Next was some “vacation” time up in my second home of Truckee with my besty, Tanya. Tanya owns BYSierra (two locations, Truckee, CA and Reno, NV). I did teach while I was there, but it was more just like fun as I visit there 2 or 3 times/year. 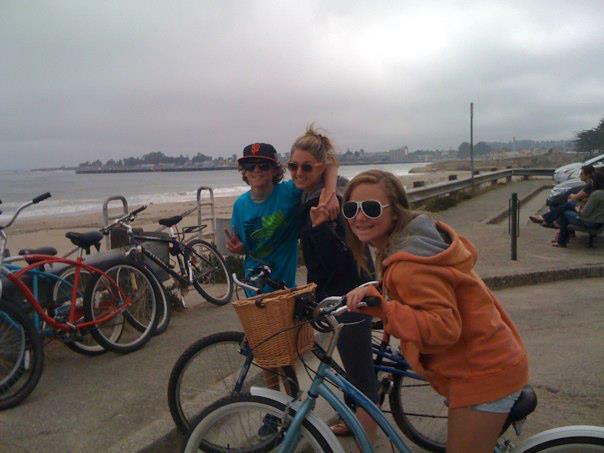 However, we did take a side trip down to Santa Cruz for the Labour Day weekend…talk about a different kind of vibe! We spent the 4 days mostly at the Boardwalk-they have FOUR kids-going on rides and people watching. I haven’t laughed so hard in ages…rides are FUN! Who knew? I did get to take a class at the studio there, Village Yoga. I was so happy to get my sweat on while we were there…the studio is a much different pace than BYSierra…the vibe is slow and chill…least that’s how the class we took was. Best part about the studio? They have KOMBUCHA ON TAP!! Fab. Ok, then was on to Phoenix to hang with the yogis of BYParadise Valley. The funniest thing about Phoenix is that the busiest time is in the SUMMER because it’s too hot to be outside…it’s actually cooler in the yoga room! ha! I love it. Again, I was thrilled to be able to meet and hang out with so many teachers in Phoenix…what I didn’t know is that there are many studios (7, I believe) all in the general greater area of Phoenix and the surroundings. So, that makes for many teachers to draw from. I spend the weekend working at the Paradise Valley studio, a well established studio that is run by Nicole Deacon. Nicole is only 29 but has been practicing since she was 13! Can you believe it, that’s SIXTEEN YEARS?! I’m not gonna lie, Phoenix was H.O.T. I mostly like it, but a little bit I could see it getting old after several days over a hundred degrees (that’s somewhere in the high 30’s for my Canadian lovlies). I often get asked the question of where is my favourite place and/or favourite studio. I always have to stop to think. Each studio I visit is wonderful in it’s own way (cheesy but true). I have the opportunity to meet so many amazing people all over the world…teachers and students. The things I learn along the way are invaluable, both in my personal life and professional life. At risk of sounding too corny, here goes. I really DO have the best job ever. Ok, here we go…I’m on the road, so I’m on the ipad, so you know can’t see what I’m typing (by the way,if anyone knows hot to make it work better, let me know! )…so, this post will be short. I’ve been having such a great summer, doing a ton of yoga and enjoying so many new cities and studios and yoga communities! I was in Birmingham, Alabama and that was fun, so good to visit a new studio (4 months) and see a new community grow. Then I was in Dallas at Bikram Yoga Richardson…a studio with a huge flare and energy! Then I went to Austin…what cani say about Austin…..I kind of love it there! Such a fun city, a great yoga community…the vibe is super up my alley. Did you know that there are 111 places to do yoga in Austin? Seriously. Then to San Antonio for a few days. A great visit with Lisa and Lynn, and the SA crew. Next weekend I’m in Phoenix. Whew. What a trip! Y’all, wake surfing, ping pong, advanced class like crazy, Yogasm in the oRt, bowling, Mexican food (maybe too much Mexican food! )…..it really has been a wonderful summer. I’ve had it packed full of lots and lots of yoga, but also found a wonderful balance of doing fun stuff outside the yoga studio and the balance feels wonderful. Ok, I just read through this post and there are a few crazies…things that don’t make any sense! Haha.I can’t fix them, so good luck with that. Peace out, kittens, I’ll post a good one when I’m at a computer….